Earlier this month, I wrote a blog on how police departments in Maine are using enterprise mobile mobile business apps to communicate with citizens to help fight crime in their communities. A recent story on Citizen Services by John Moore for the Digital Innovation Gazette included an interview with Lisa Wolfisch, chief of the U.S. Census Bureaus’ Web & Social Media Branch and Alexander Permison, who works with the Census’ Application Services Division. Ms. Wolfisch and Mr. Permison spoke on the August release by the U. S. Census Bureau”s release of its first mobile app, America”s Economy along with a public API which allows developers to build their own mobile business apps using Census data. Both of these releases are in keeping with the White House”s Federal Digital Strategy, which calls for agencies to boost access to data. When you develop an Enterprise Mobile App with the Snappii WYSIWYG (What You See Is What You Get) Visual Drag and Drop Editing Platform, you can easily include your entire app development team in the entire app design and QA process together. Ongoing additions and adjustments are easily built in the Snappii Platform and again can incorporate your entire development team to ensure every team is able to contribute and participate throughout the process. Do you have an app and/or an app development idea utilizing U.S. Census Bureau data? With the announcement of the release of Snappii 2.0, it also opened up the door to utilizing data bases in Enterprise Mobile Apps developed on the Snappii Platform. You can read more about Data Integration in this recent Snappii Blog. I wish you the very happiest of holidays and encourage you all the benefit you can receive building your organization”s mobile business apps using the Snappii Platform. 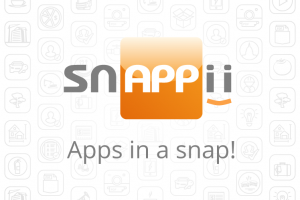 Whether you be a local, state or federal agency, an enterprise corporation, a private business person, or an individual business person or app designer, Snappii will free you from the cost of app development and provide you with all of the resources to design your own Enterprise App for the new year. This entry was posted in Blog and tagged government by Alex Bakman. Bookmark the permalink.